CAMARILLO, Calif., May 29, 2018 –Semtech Corporation (Nasdaq: SMTC), a leading supplier of high performance analog and mixed-signal semiconductors and advanced algorithms, today announced its developing Tri-Edge, a PAM4 clock and data recovery (CDR) platform optimized for low power and low cost PAM4 optical interconnect for data center and active optical cable (AOC) applications. Tri-Edge is a new CDR platform technology being developed for the PAM4 communication protocol of next-generation data centers, and was on display at the Semtech booth by appointment only at OFC in March 2018. 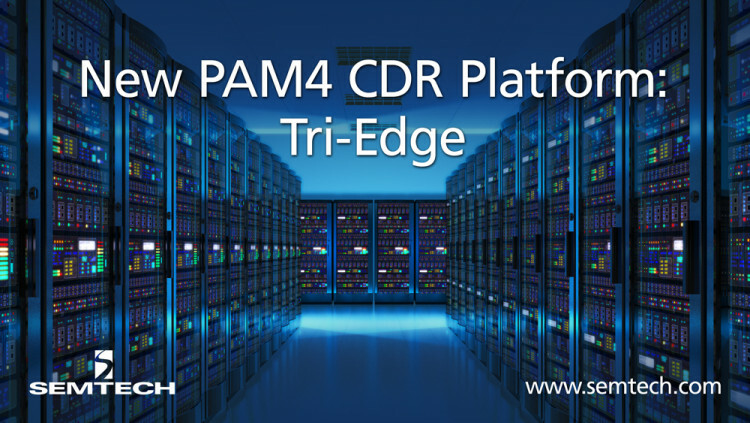 Tri-Edge builds on the success of Semtech’s ClearEdge® NRZ-based CDR platform technology, and extends it to PAM4 signaling. Semtech’s ClearEdge CDRs are the world’s most widely selected optical transceiver CDRs for use in 10G applications and 100G data center applications. Recent advances in optics performance, CDR compensation circuitry and PAM4 techniques, have led to the conclusion that for shorter reach, high-speed applications, a low power PAM4 CDR solution is technically viable. Semtech’s Tri-Edge CDR platform is expected to be applicable for 100G, 200G and 400G requirements. The multi-faceted development project targets the needs of the rapidly evolving data centers throughout the world and leverages vertical-cavity surface-emitting laser’s (VCSEL) and silicon photonics-based optics along with optimized Tri-Edge CDRs to enable disruptive performance, cost and power performance. “The rapidly growing demand for bandwidth in the data center market requires a disruptive solution to meet the power, density and cost requirements. By combining leading-edge technologies with a focused application, we can enable a disruptive solution that we believe will meet the needs of the data centers in both the near-term and long-term,” said Imran Sherazi, Vice President of Marketing and Applications for Semtech’s Signal Integrity Products Group. Semtech Corporation is a leading supplier of high performance analog and mixed-signal semiconductors and advanced algorithms for high-end consumer, enterprise computing, communications, and industrial equipment. Products are designed to benefit the engineering community as well as the global community. The Company is dedicated to reducing the impact it, and its products, have on the environment. Internal green programs seek to reduce waste through material and manufacturing control, use of green technology and designing for resource reduction. Publicly traded since 1967, Semtech is listed on the Nasdaq Global Select Market under the symbol SMTC. Contact Semtech’s support team for technical support or general product inquiries. Follow Semtech on Twitter, LinkedIn, Facebook, and Google+. For more information, visit www.semtech.com. All statements contained herein that are not statements of historical fact, including statements that use the words “will,” “being developed for,” “expected to,” “targets,” “can enable,” “designed to,” or other similar words or expressions, that describe Semtech Corporation’s or its management’s future plans, objectives or goals are “forward-looking statements” and are made pursuant to the Safe-Harbor provisions of the Private Securities Litigation Reform Act of 1995, as amended. Such forward-looking statements involve known and unknown risks, uncertainties and other factors that could cause the actual results of Semtech Corporation to be materially different from the historical results and/or from any future results or outcomes expressed or implied by such forward-looking statements. Such factors are further addressed in Semtech Corporation’s annual and quarterly reports, and in other documents or reports, filed with the Securities and Exchange Commission (www.sec.gov) including, without limitation, information under the captions “Management’s Discussion and Analysis of Financial Condition and Results of Operations” and “Risk Factors.” Semtech Corporation assumes no obligation to update any forward-looking statements in order to reflect events or circumstances that may arise after the date of this release, except as required by law.